Apple(s AAPL) issued the first update to its new desktop software Thursday: OS X Update 10.8.1. The software fixes a variety of bugs discovered when Mountain Lion was released a month ago. 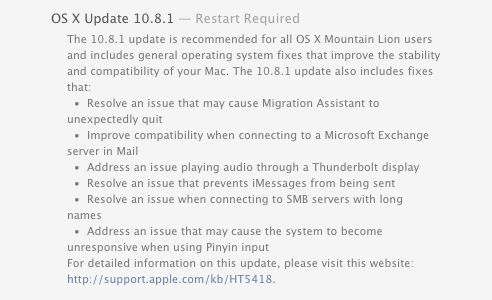 Among other fixes, Apple says 10.8.1 should address a problem related to playing audio through a Thunderbolt display, and another with iMessage sending. It also appears the update may address battery life problems that cropped up for some MacBook owners after installing Mountain Lion. Mountain Lion went on sale for $19.99 in late July, and is Apple’s first attempt to sell desktop software entirely through the Mac App Store. So far, it’s working well. The company announced that it had sold 3 million copies in the first 4 days. And likely because of the ease of downloading directly from the App Store, it was one of the fastest desktop software uptakes in Apple’s history: after two days it was already on 3.2 percent of Macs. Users will be prompted to update automatically or you can find the update in the Mac App Store under Updates. I meant to say ‘when I installed Mountain Lion’ instead of Lion. I was using the beta version of messages without any problems. When I installed Lion, I was routinely informed that the person I was trying to send a message to was not registered with iMessage even though I was receiving messages from those same people. The 10.8.1 update didn’t fix the problem. The only work around I’ve found to consistently work is a reboot. Just a note that not all iOS updates have been free. The upgrade on a 2nd Gen iPod Touch from iOS 3 to 4 had a cost associated with it. I’ve forgotten what the price was, but there is a precedent for iOS upgrade having a price tag. I know, that’s why I used the present tense after talking about the iOS 5 example. The previous costs for iPod Touch users were related to an accounting method Apple used to use, but it did away with that in 2010.
same….. Messages doesn’t work!!! Some update?? More like a downdate….. or a backdate…..
iMessage doesn’t work anymore after the update. Help! After the Upgrade my Apple Mail is not starting up anymore !